No, I don't agree with stores being open so early on Black Friday and even on Thanksgiving Day. It is a holiday after all! Just because someone works retail doesn't mean they need to pay the price of missing out on sleep and time with loved ones. I don't agree with stores opening at ungodly hours to satisfy their bottom lines while offering deals that are supposedly irresistible to shoppers. I don't like the whole craziness of these shopping days and what they stand for. I personally try to never participate if I can help it. A few years back, I got one thing online and regretted it because, despite the reviews, it was cheaply made and only lasted three months. The problem with Thanksgiving Day and Black Friday shopping is that the public is feeding the problem. The stores are offering these deals and opening at ungodly hours. The public flocks to these sales forsaking their families, work and sleep. The workers are scheduled and, in a lot of cases, forced to work on the holiday because they are told they cannot take those days off or call in sick. Trust me, I understand the lure of the sale. I understand why shoppers do go to get a good deal on an item. If the shopper really needs the item, it would be very difficult to pass up the good deal. I usually advocate saving money any way you can, but for some reason, I can not condone Thanksgiving Day and Black Friday shopping. I see a lot of people going in debt and using credit cards to pay for items they cannot afford. People buy gifts for their families and friends that will be played with or used a few times and discarded. They bought the item for that person just because they were able to get that gift at such a "great" price. Do yourself and your family a favor. Stay home on Black Friday. If you feel the need to be out on Black Friday, do so at a reasonable hour. Camping out at a store, battling others for the sale items, and spending you do not have is not the way to make great memories. Send the stores a message that their early sales and being open on a holiday is just not what consumers want. Send an even bigger message that they can run these sales on a reasonable timetable and stop the craziness of Black Friday. 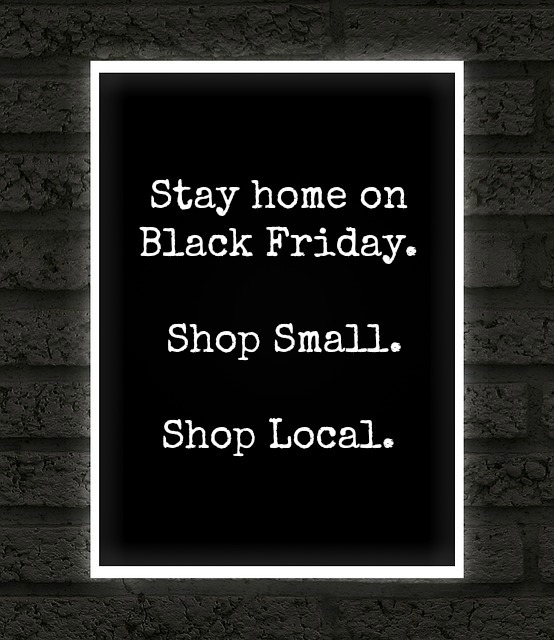 Better yet, shop small business owners and local businesses. Shop your friends' items for sale. Shop on Etsy. Even on eBay, most of the sellers are selling for a side hustle and could use the extra love. Take the money away from corporate greed and give to someone who needs the money for their family, home, and business. There is a lot of excellent products available and always something for everyone. You may spend a little more money, but you will be knowing where your money is going and you will have a quality item to give to your loved ones. Most people love a good story behind the gift and would love to know that the item came from a small business or a local artisan. In the next few posts, I hope to give you ideas and promote products from other small business owners and bloggers. We all have great products and items that will be a lovely and thoughtful gift to give others. I also hope to give you a list of ideas that you can make yourself (Yes, you still have time!). A handmade gift says a lot about the people giving it as well as the person receiving it. I will also be posting links in social media to my Amazon store. While this may seem contradictory, I hope to promote primarily other bloggers and other small business owners' products who happen to sell their items on Amazon. Sometimes, Amazon is the only viable place to sell most of their products. I will add items that I find to be very beneficial in my life, but not many as of right now. This holiday season, please be conscious of how your money is spent and where it is spent. Keep it away from corporate greediness as much as possible and keep it small and local.